No matter if you’re staying home or leaving for some vacation – it’s summer and we should enjoy it. 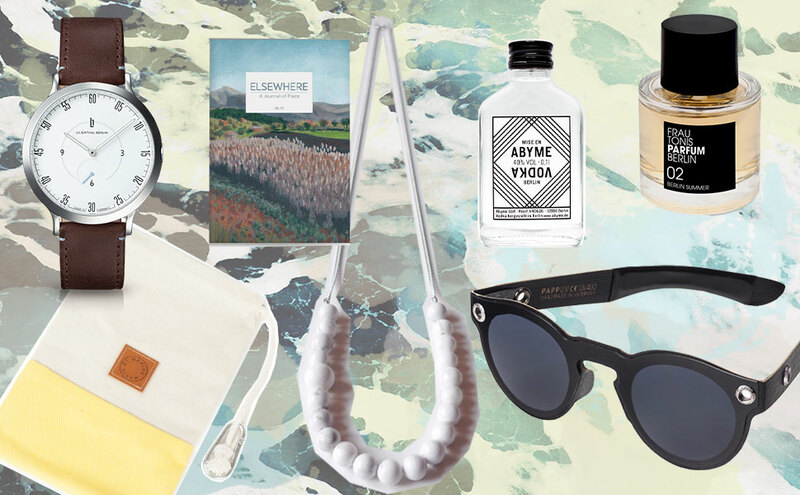 Fun days by the water, warm evenings spent in cafés or crazy nights out in the city – we’ve gathered some of our favorite summer accessories that are perfect for almost every occasion! Our number one are the glasses by Papp up. Poet is a model, that’s not only great looking, but also a 100% UV proof, scratch free and super strong. You an even accidentally sit on it – won’t break. Together with your keys, money etc. it can be stuck inside this beautiful little bag in the bag by Marin et Marine. It’s made out of organic cotton and comes in different, beautiful colors. Delicious Mise en Abyme vodka is available in three different sizes. The little one fits in every purse or bag and is perfect for fun summer nights. Before going out you can freshen up with the beautiful eau de toilette, called Berlin Summer – so delicious! If you can steal a quiet moment you can reach out for a good read. Elsewhere is a beautiful journal, dedicated to places. drifting excursions through city suburbs and journeys on foot along the ancient old ways; written sketches of airports and market squares, forests and riverbanks; the legends that linger on mountainsides and the folklore of the flatlands; the everyday realities of island communities and the streetlife of city neighbourhoods… amazing!